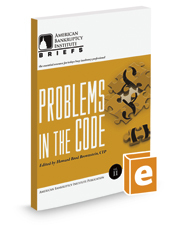 Drawing on articles that originally appeared in the ABI Journal, as well as fresh new insights, Problems in the Code, the second in a digital series known as ABI Briefs, offers commentary from leading bankruptcy practitioners regarding areas of the Bankruptcy Code that, in their opinion, need reform. Edited by Howard Brod Brownstein, Problems in the Code includes sections on constitutional law, executory contracts, intellectual property, real estate and environmental issues, and confirmation and postconfirmation issues. A final chapter details the work of the ABI Commission to Study the Reform of Chapter 11. The commission, launched in 2012 and tasked with gathering testimony on possible needed changes to the Code enacted by the Bankruptcy Reform Act of 2005, plans to present its findings to Congress in 2014.